During his keynote at F8 2016 in April, Facebook CEO Mark Zuckerberg laid out the social network's plan for the next 10 years. It involves, in simplest terms, connecting the entire world via the internet, and he described various ways Facebook intends to make that happen. Facebook's strategy calls for some heady initiatives, like building its own Wi-Fi network and sending satellites to space. It's wildly ambitious for a company often best known for baby pictures and Chewbacca Mom, and not something I gave full credence when I first heard Zuck lay it all out. Plenty of companies talk a big talk, but how many of them ever pull off what they say they're going to? I'm still not completely convinced Facebook can connect all the reaches of the globe with the internet – not least because if its various efforts don't make money, shareholders could start grumbling – but as time's passed, Facebook has shown it's committed to developing the tech it's talking about. 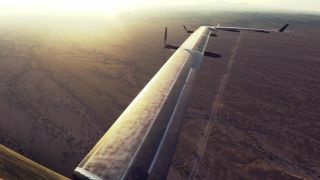 That's the story today as Facebook announced it held the first full-scale test flight of Aquila, its solar-powered, internet-delivering drone plane, sending the aircraft soaring for 96 minutes over the Arizona desert. The test flight gave the Aquila crew a close look at the plane's takeoff, aerodynamic design, battery and power performance, autopilot functions and how it fares in real-world conditions. Almost everything went according to plan, Facebook said in a blog post. The flight also put into perspective the challenges Aquila still faces, such as gathering enough energy from the sun for all its moving parts and keeping its batteries topped off for those times it doesn't have sunlight. The obstacles don't end there: the aircraft has the wingspan of a commercial airliner, yet one-third the weight of a car. So, while it can fly at an efficient 25mph at sea level (commercial airliners are booking it at 200mph), it also bucks most of the rules of aeronautical engineering. Last but not least, keeping the entire project economical so that it really is a viable alternative to current modes of internet delivery presents another unique challenge. The Aquila team plans to continue testing the aircraft at different speeds, heights and designs, all with the aim of putting together an entire fleet that will soar the skies and beam down broadband. When it's completely up and running, Aquila will fly for up to 90 days, delivering internet over 60-mile-wide swaths, often in areas that've never had it before. According to Facebook, less than half the world has internet access, and 1.6 billion people live in regions that lack access to a mobile broadband network. Aquila's accomplishment is a milestone step in further connecting the world, though I'm acutely aware that more people with internet access (courtesy of Facebook) also means more people who have Facebook, which means more ad dollars going to the social network's coffers. But leaving that aside, the test flight shows that Facebook's ambitions are attainable, and that the internet doesn't have to be confined to the delivery pipelines we're used to. It's often unrealistic and prohibitively expensive to build internet infrastructure in the places that don't already have it. Yes, these planes are unconventional, but they also aren't as preposterous as they may first seem when you consider the geographical challenges of laying fiber in more remote parts of the world. One successful test flight doesn't mean internet planes will fill the skies overnight, but it proves it can be done, and not just by Facebook. Google has its own internet drone plans, though we haven't seen them materialize in the same way as Facebook's yet, as well as its Project Loon initiative. Facebook's flight could light a fire under Google to pick up the pace of its drone development, if only to keep the social network from cornering the friendly skies. If you'd asked anyone 10 years ago whether one day Facebook would successfully fly a solar-powered plane that delivers the internet, they'd have said you're nuts. Now, we've seen it happen, and can only wonder what comes next. When will we really have 5G networks?